Last Saturday I had the pleasure of seeing The Muppets at the Prince Charles Cinema (yet again, I am becoming a regular), with the help of Den Of Geek- I won a pair of tickets by Twitter (it is fast becoming my best friend and an obsession). Short version of the story: I LOVED IT! Long version: The viewing started with probably the funniest animated movie/clip/episode/? I have seen in a while- Toy Story: Poultry Palace. Me and the rest of 299 people in the cinema theatre laughed out loud like crazy and it was a great start for the next one hour and a half. 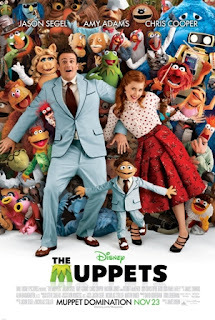 The film is about 3 Muppet fans who learn that Tex Richman wants to drill under the muppet theater for oil, and so Gary, Mary and Walter set out to find the muppets who have been split up for years- it is the story of a reunion of one of the greatest shows in America. James Bobin directed a script written by Jason Seigel (also starring) and Nicholas Stoller. The film has so sweet and endearing and entertaining, that I walked out of there in a such a good mood, not to mention that I had a smile on my face for 90% of the movie. The script is funny and includes some unexpected moments of reality check ("well, this movie is going to be short", "wow, that was such an expensive looking explosion! I can't believe we had that in the budget" or "I thought my storyline was very intriguing"), that raised laughs from the viewers. The ocassional cameos were a nice touch and helped the storyline (Dave Grohl, Emily Blunt, Alan Arkin, Zack Galifiniakis, Jack Black, Selena Gomez and a very cool scene with Jim Parsons), plus the unbelieveable Gary Cooper musical moment will blow your mind away. After seeing this movie, I have an even greater respect for Jason Seigel (known for his stint in How I met Your Mother); I recently saw an interview with him talking about the movie and saying that it is his passion project and that he has been trying to get it done for a long time. For me, he seems like a kid in a grown man's body- he is sweet, energetic, fun to be around, just a nice guy and this movie is a great way to showcase that. He managed to make the Muppets story and characters fresh and appealing to everyone, adding so many distinctive elements that make the film even more special and memorable. Honestly, you may think: "Oh, a Muppets movie? it's for kids, neah, I wont go" but trust me, it's a wonderful film, for all ages and it will make your day! Please give it a shot, it is worth it! It was a great experience for me! Longtime Muppet fans will undoubtedly have more fun than young ones, but for the most part, it’s a witty, delightful romp, that shows you that you can still be funny, without ever being mean still in 2011. Good review Aziza. @Ruth: Yeah, those cameos were great, too! Anything with Neil Patrick Harris is bound to bring a smile on your face! @Dan: I like what you said: "you can still be funny, without ever being mean"- you're right! Thanks! I didn't watch The Muppets much when I grew up but the feverish rave response to this movie really got me intrigued! I will rent it for sure. As for the "you can still be funny, without ever being mean" I wish someone could tell that to Ricky Gervais! @Ruth: I was a Muppets newbie when I saw the movie, and I still love it! You should rent it for sure! Wasn't this such a fun movie? I haven't smiled so much in my life at the cinemas. @Stevee: Yeah, I know, me too! It was great! I am a big muppet fan and this film definitely had plenty of good homages and humour, but it still felt quite unoriginal and generic, despite it being self conscious of that. A 7.5/10 from me, but still, it is a wonderfully made film. Just not 9/10 material for me. Great review! @FilmMaster: Hello there new commenter! :) I don't know if it was that unoriginal(haven't seen too many Muppets episodes), but what I do know is that it was a feelgood movie, I was happy going out of the theater, and maybe I liked it so much because I wasn't expecting too much from the movie, it's still a comedy, and it is mostly for kids, I think! Thanks for the comment! Hey, guess what? I received an award!